Looking to cool your house off this summer? Wanting to stay warm in the winter? Temperatures will sky rocket to triple digits or stumble below freezing. There are ways you can help keep your utility payments under control. Money management moves beyond the check book and bank account and into practical living. Cutting back does not always mean that you have to give up on your lifestyle. A money-smart household will efficiently help you decrease your utility budget. Fight off cooling and heating costs by properly insulating your home. There may not be enough money in the budget to do it all at once. Start with the attic floor. This is the most important place to begin. Afterward, move on to the basement if you have one, exterior walls, and then floors. The final areas are any crawl spaces found in the home. Since heat rises, your attic is the first stop for better protection. In summer months, when the heat from the sun bares down on the roof, the insulation will act as a barrier to the home. Ventilation will help alleviate the heat in the attic. To help keep moisture from building, it is best to install an exhaust fan if you have windows up in the attic. Plant trees to help protect day time sun bearing down on the house. 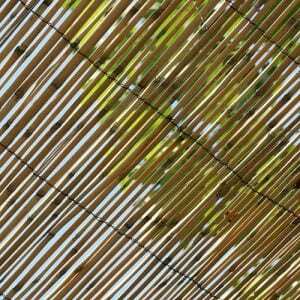 If you don’t plan on living in the home for long or want shade now, install retractable awnings over windows with afternoon sun. Cover the outside of you windows during summer months. 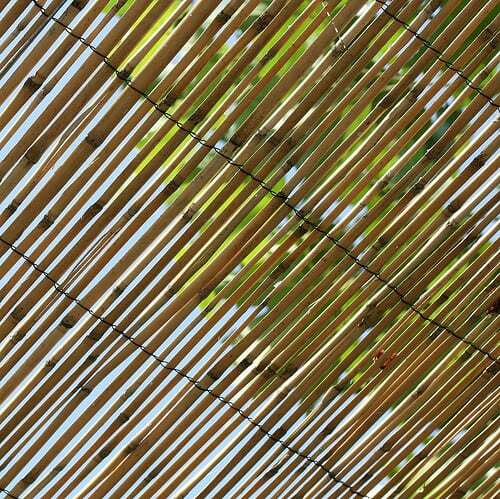 Bamboo shades work well to absorb the heat and protect your home. Shutters work well too. Windows in unused rooms should have permanent covers. Reflective curtain liners. The reflective side should face outside during the summer months to keep heat out and face inward during the winter to keep heat in. Become a fan of fans! The air conditioner and the utility bill are not the best of friends. During those hot summer months, the AC becomes one the most expensive appliance you own. In order to lower the demand for air conditioning, try one of the next 3 methods to beat summer heat. Set your thermostat to 78 degrees. When the heat outside is pushing 100 degrees, your room set at 78 will feel good. Use fans! The more the air circulates, the cooler the air. Still air feels much warmer. 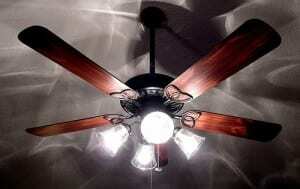 Ceiling fans work great to ventilate a whole room. You don’t have to spend money on fans if your home does not have them, box oscillating fans will do the job. When the sun goes down and the night air cools, turn off your ac and open the windows. Take your fans over to the upstairs windows and point them outward. The fans will now work to remove the warm air of your home to the outdoors. A box fan would work well here. You can prop it up against the window for the best results. The downstairs windows should also be open. These windows will take in the cool evening air. If it is humid, you won’t want to bring the humid air in. The air conditioner will have to work harder to keep humid air cool. Now that we know how to keep the hot air out, it is important to address how to reduce heat from within. Start in the kitchen. Use smaller appliances or outdoor grills to cook food rather than heat up the over and stove top. A microwave, toaster/convection oven, slow cooker or electric frying pans create less heat than their larger counterparts. 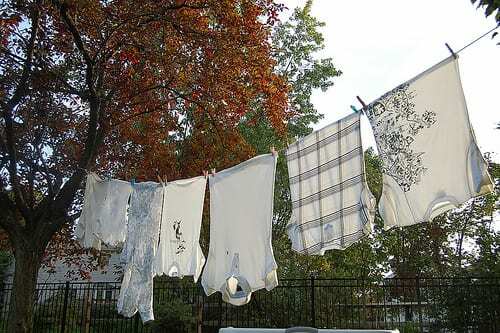 Use the lowest heat setting on your dryer or better yet, hang the clothes outside to dry. If you are going to use the dryer, stick a clean dry towel in with the wet clothes. It will help to absorb the moisture. Turn off the heated drying cycle on your dishwasher. Let them drip dry. Refrain from opening the dishwasher door after the rinse cycle so the added steam does not warm the room further. Keep your window curtains a light color. Since dark colors absorb more heat, the lighter color will help repel it. This is true for the color of your home too. Looking to keep the heat in? There are ways to keep your budget trim during the winter months too. Lower the temperature set on your thermostat. Wear layers in the house during the day. In the evening, you will want to turn it down even further. Put extra blankets on the bed to help keep you warm. The ceiling fan will be useful to push warmer air back into the living area of the room. Vacant rooms should have doors and vents closed. Humid air keeps air warmer, so turn on a humidifier or keep a kettle or pan of water on a wood furnace or pellet stove if you have one. Add another layer to the windows by installing storm windows. Heavy curtains will help too. Keep curtains open during the sunny days. Seal up doors with weather stripping and use caulking for windows and cracks that will let heat escape. You can put a folded towel along the bottom of doors to help keep cold drafts out. It isn’t always about keeping warm air in as it is keeping cold air out. The flue in the fireplace should remain closed when not in use. The winter wind will find its way into your home if you let it. Keep up with regular maintenance work on your air conditioner, oil burner and water heater. Have your chimney cleaned yearly as well. It’s like preventative well-checkups for your home. It also helps to keep repair and replacement costs down. Your utility bills do not have to shoot through the roof when Mother Nature calls. There are many low cost efficient ways to minimize utility expenses. Your budget will be better off in the end. Check with your local utility companies for income-based savings programs. Every penny counts! This entry was posted in Budgets and tagged budget, cutting budget costs, cutting heating costs, money management, saving money, smart money, utility savings. Bookmark the permalink.